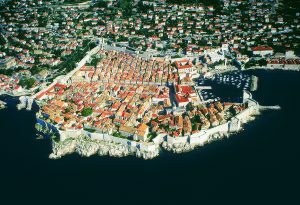 There are several theories regarding the founding of the beautiful city of Dubrovnik, originally called Ragusa. The general consensus is that it was founded in the 7th century by refugees from a nearby Greek city who were escaping the invasions in their cities. However, there have been findings such as Iron Age jewellery and coins that suggest there were Roman inhabitants as early as 3rd century BC. Until 1205, Dubrovnik was under the protection of the Byzantine Empire until it came under the sovereignty of Venice from then until 1358. It was during this time that the old town was completed and still remains as a reminder of Dubrovnik’s rich history. 1358 marked the Venetian rule come to an end and become part of the Kingdom of Hungary, although they were granted much more independence than before. Dubrovnik grew from strength to strength in this period and quickly became a main competitor to the Venetian empire for the waterways with their growing maritime influence. It was also known for its forward thinking laws and institutions including their medical services and abolishment of slave trading in 1418. For many centuries after, Dubrovnik was very economically wealthy with its skilled diplomats and rich sea trading. However, a catastrophic earthquake in 1667 devastated the land, killing over 5000 citizens and destroying many public buildings. The Republic never truly recovered and quickly fell into decline following the earthquake. They were forced to sell off some of the land to the Ottomans. They began to recover thanks to the reconstruction of the maritime trade but were conquered by Napoleon’s Army in 1806 who abolished the Dubrovnik Republic soon after. The Congress of Vienna established the Kingdom of Dalmatia in 1815 which put Dubrovnik under the Habsburg Empire, also known as the Austro-Hungarian Empire. They ruled over Dubrovnik until 1918, where it fell under the Kingdom of Serbs, Croats and Slovenes. World War II saw Dubrovnik become The Independent State of Croatia, which was a puppet state of Germany. After the war, Dubrovnik was under communist rule until 1991 where it was sieged during the Yugoslavia civil war and vicious bombings nearly destroyed the UNESCO World Heritage site and various historic buildings in the Old Town. Now it is a perfect example of the beautiful Croatian region and a city you must visit to truly embrace Croatian culture.